THIS IS MY BELOVED SON IN WHOM I AM WELL PLEASED; LISTEN TO HIM. This Sunday, we celebrate the transfiguration of the Lord. In Matthew's Gospel (17:1-9), we hear the account of Jesus appearing before his three favorite apostles with Moses and Elijah. Our gospel today offers a glimpse of Jesus' glorified body after resurrection, which will be ours as well. In this scene, Jesus forms the bridge between the old law (Moses), the prophets (Elijah) and the new covenant (Jesus). Jesus took Peter, James, and his brother, John, and led them up a high mountain by themselves. And he was transfigured before them; his face shone like the sun and his clothes became white as light. And behold, Moses and Elijah appeared to them, conversing with him. Then Peter said to Jesus in reply, "Lord, it is good that we are here. If you wish, I will make three tents here, one for you, one for Moses, and one for Elijah." While he was still speaking, behold, a bright cloud cast a shadow over them, then from the cloud came a voice that said, "This is my beloved Son, with whom I am well pleased; listen to him." When the disciples heard this, they fell prostrate and were very much afraid. But Jesus came and touched them, saying, "Rise, and do not be afraid." And when the disciples raised their eyes, they saw no one else but Jesus alone. In our first reading (Daniel 7:9-10, 13-14), we hear an apocalyptic vision of Daniel of the end times when "one like a son of man" appears before the "ancient one" (The Father) and is given "dominion, glory and kingship." Son of Man is how Jesus often referred to himself and this passage was seen by early Christians as a clear foretelling of the coming of the Christ. As I watched: Thrones were set up and the Ancient One took his throne. His clothing was bright as snow, and the hair on his head as white as wool; his throne was flames of fire, with wheels of burning fire. A surging stream of fire flowed out from where he sat; Thousands upon thousands were ministering to him, and myriads upon myriads attended him. The court was convened and the books were opened. 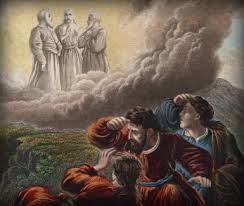 As the visions during the night continued, I saw: One like a Son of man coming, on the clouds of heaven; When he reached the Ancient One and was presented before him, The one like a Son of man received dominion, glory, and kingship; all peoples, nations, and languages serve him. His dominion is an everlasting dominion that shall not be taken away, his kingship shall not be destroyed. In our second reading (2 Peter 1:16-19), St. Peter describes his eyewitness account of the transfiguration. He calls us to be attentive the Father's declaration, "listen to him". Beloved: We did not follow cleverly devised myths when we made known to you the power and coming of our Lord Jesus Christ, but we had been eyewitnesses of his majesty. For he received honor and glory from God the Father when that unique declaration came to him from the majestic glory, "This is my Son, my beloved, with whom I am well pleased." We ourselves heard this voice come from heaven while we were with him on the holy mountain. Moreover, we possess the prophetic message that is altogether reliable. You will do well to be attentive to it, as to a lamp shining in a dark place, until day dawns and the morning star rises in your hearts. All three readings today show us the majesty and glory of our savior, Jesus, who truly is the beloved son of the Father. As we ponder the call to "listen to him", may it be more than one hour a week. May it be every waking moment of every day.